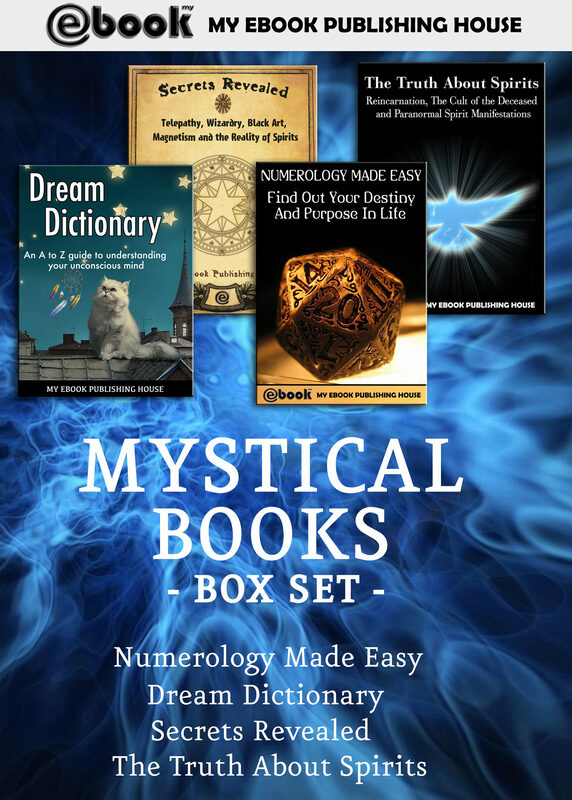 Now, for the first time ever, and only for a limited time, you can get this value-priced, limited edition boxed set.Mystical Books Box Set includes four bestselling books from My Ebook Publishing House:Book #1Numerology Made Easy: Find Out Your Destiny And Purpose In LifeNumerology is a very ancient science dating back thousands of years. It offers an insight into the personality by assigning numeric values, or numbers, to the letters which are contained in names.Numerology, the simplest of the occult sciences to master, offers deep insights into the personality. You can use numerology to understand yourself, friends, associates and lovers. You can see the dynamics of relationships and you can determine the best time to marry, change jobs, move, invest and travel.You can count on the numbers to reveal the truth about people and the world--and you can count on this guide to help you understand the numbers. With easy-to-follow examples, this book shows how to analyze your own and others' characters, personalities, destinies, and karma. This book, Numerology Made Easy: Find Out Your Destiny And Purpose In Life, covers several topics including: your personal number, your destiny, your purpose in life, your relationship with that other person, the meaning of a certain day, the karma of the year, your lucky numbers, your marriage, your accomplishments, and so much more!Book #2Dream DictionaryWhy we dream is still one of the behavioral sciences' greatest unanswered questions.The average person will dream over 150,000 dreams in a lifetime--each one a complex web of imagery and deeper meaning. Dream Dictionary uses the interpretation of actual dreams from contemporary dreamers, just like you, to help you access the substance and meaning of your own dreams.See what is happening in your body, in your mind, and in your most guarded self and intuitions.... It’s all here, and more, in the ultimate guide to your world of dreams!Accessible and engaging, Dream Dictionary shines a bright light on our nocturnal journeys and tells us what the sleeping mind reveals about our waking hours.Book #3Secrets Revealed: Telepathy, Wizardry, Black Art, Magnetism and the Reality of SpiritsSecrets Revealed opens the path toward a lifetime of psychic exploration and discovery.Read about the amazing secrets of telepathy, wizardry, the black art, magnetism, clairvoyance and the spirit. Learn about the detaching phenomena - the separation of the astral body of the physical and ethereal body.This book reveals the truth about spirit manifestation in the phenomenon called paranormal. Research still continues to confirm the existence of this paranormal powers. With this book you can develop your higher faculties, enriching your own life and that of others, and enabling self-transformation on a new and deeply satisfying level. This book opens the path toward a lifetime of exploration and discovery.Book #4The Truth About Spirits: Reincarnation, The Cult of the Deceased and Paranormal Spirit ManifestationsHumanity has always had a fascination with the search for truth and meaning. The Truth About Spirits help you find the true meaning of life. You will read about reincarnation, the cult of the deceased and the truth about spirit manifestation in the phenomenon called paranormal. When you read The Truth About Spirits, you will find what often feels like death, is instead rebirth. Your soul transformed; forged anew.